Annie George contacted me back in November 2015 as she was researching the history of a bronze plaque that she had just acquired in a box of collectables at auction, in Plymouth. Rather than selling it on to a collector or dealer, she wanted it to be appreciated properly, and hoped that a former shipmate of HMS Alaunia would be interested in buying it. To assist Annie, I offered to act as a “go between” and advertise the plaque on the HMS Ausonia web page. 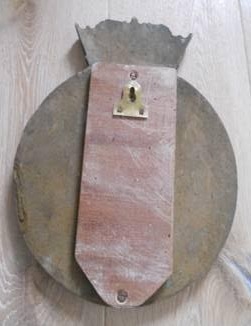 The provenance of the plaque is unknown but going by the inscription on the front we can determine that the plaque was awarded to a rating that had just completed the MTC course on 13th February 1952. 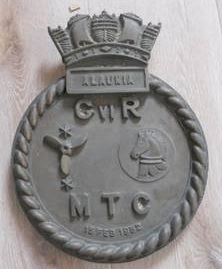 The MTC course was a Royal Navy mechanics course for leading stokers, which was held 3 times a year at Plymouth and in part, on board HMS Alaunia. Please get in touch using peterjryder@gmail.com and I will forward to Annie to complete negotiations for the purchase.